Bonsai is a very complex art form and choosing an appropriate container for your bonsai is one of the most difficult tasks faced by beginning enthusiasts. However, if chosen correctly the container will contribute to the overall aesthetic appeal of your bonsai. Below you will find the most important things to consider when selecting a container. Bonsai containers come in many different shapes and sizes; they can be square, rectangular, oval, circular, cylindrical, or abstract in shape. In order to determine which shape will best complement your bonsai, it is critical to first consider your bonsai’s style. Containers specified for certain styles not only accentuate the beauty of your bonsai, but also ensure proper growth. Please refer to the Bonsai Styles page for container recommendations for specific styles. When determining size, it is important to get a sense of proportion. For the most part, experienced enthusiasts can break certain rules and still make their bonsai look stunning, however there are two rules of thumb that will help you select the proper size of container. Depth should be approximately 1/3rd the total height of your bonsai (base of trunk to top of leaves/branches). For example, if from the trunk base to the top your tree measures twelve inches, your pot should be approximately four inches deep. This rule abides by certain laws of aesthetic proportion, but is also beneficial for the trees health by ensuring that the tree has enough potting mix to support its size. Length is important when considering balance and aesthetics. The rule of thumb states that the pot should be approximately 2/3rds the total height of the tree. For example, if the total height of your tree is 12 inches, the length of the pot should be eight inches. Note: When selecting a pot, make sure that the focus of attention is still the bonsai and not the container. The container is only there to increase the overall beauty of your bonsai. Bonsai containers can be made from wood, plastic, mica, terracotta, stoneware, natural rock, and porcelain. 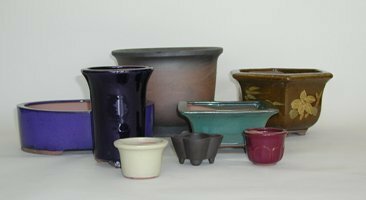 Each material serves a slightly different purpose, but stoneware is arguably the best choice if one has the funds. 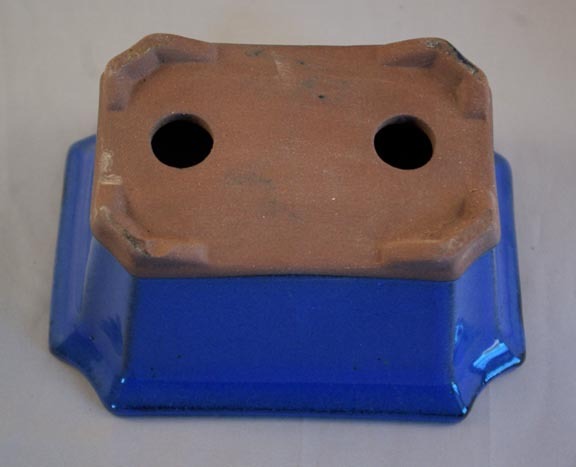 Mica, plastic, and wood containers are often used as training pots because they are relatively inexpensive. When deciding whether to select an unglazed or glazed container, more often than not, evergreen plants will look better in unglazed containers, while deciduous and flowering plants will look better in glazed containers. When selecting a color for your glazed pot, consider a color that compliments the tree. This can be any feature of the tree for the most part. For example if you are growing a red Japanese maple, if the leaves are dark red, you might want to choose a beige colored pot to offset the dark hue of the leaves; if the leaves are light red, you might want to go with a delicate green colored container to complement the leaves. If you are growing a flowering or fruiting tree like the cotoneaster which has red berries, a dramatic contrast might be ideal by selecting a dark blue colored pot. In general, select a color that adds something special to your composition. Make sure that the container you choose has proper drainage holes. This will ensure that any excess water can drain freely from the pot, thus avoiding root rot from excess water retention.